Just a few days ago I wrote about Edubuntu, the Ubuntu-based Linux distribution targeted to the "market" of teachers, students, pupils and everyone in the industry of education. 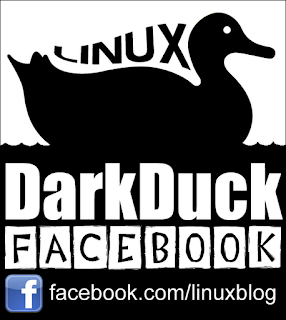 You can install this operating system on a Linux Desktop or Laptop, which you bought for your child or yourself. 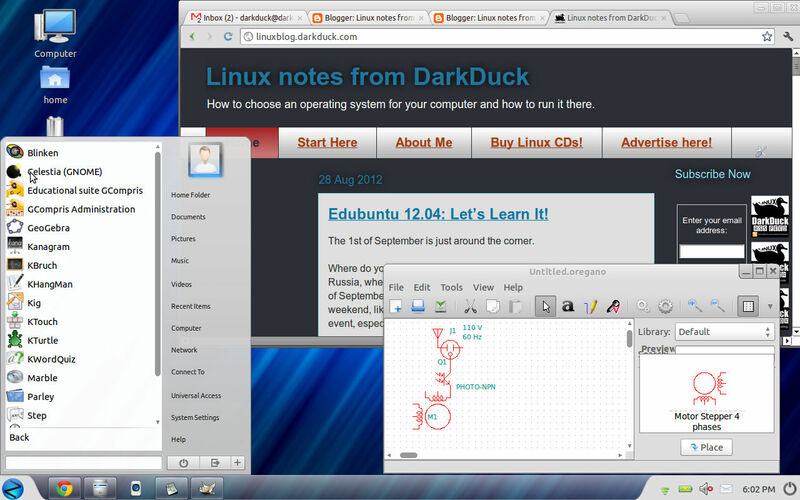 Of course, Edubuntu is not the only distribution with the purpose of helping people to teach and learn. Another example in this area is Zorin OS Educational. As you can understand from the distro’s name, this is a product of Zorin OS team, which is focused on releasing Linux-based operating systems that will ease the learning curve for ex-Windows users. The image size of Zorin OS 6 Educational is 1.9 Gb. 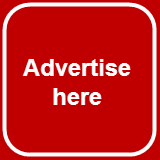 It is available from one of several mirrors for free download. I used Unetbootin to "burn" the image to the USB stick, which I later plugged into the port of my laptop Fujitsu-Siemens Amilo Pi 1505. Reboot. Choose to boot from USB. Let's go! As in the case of Edubuntu, which is very similar to Ubuntu, Zorin OS 6 Educational is not very different from its close relative, namely Zorin OS 6 Core. Even the desktop wallpaper in Zorin OS 6 Educational is not any different from the Core version. There are no education-themed wallpapers in the default distribution. It distinguishes Zorin OS from Edubuntu even on this stage. Because of this closeness, I will not describe all the features of Zorin OS again, you can check them in the linked article. Any difference from Zorin OS Core? What is the difference then? Of course, it is in the set of applications that are provided in the default Zorin OS Educational distribution. There are two additional sections in the menu of Zorin OS 6 Educational, compared to the Core version. The Education section contains a set of applications for users who are at the very beginning of their learning. The set includes Tux Math, Tux Typing, Tux Paint, KHangMan, KBruch, GeoBra, Marble and many more. The Science section contains some applications for more sophisticated users: a chemistry handbook Kalzium, a drawing tool for electrical circuits Oregano, an astronomy sky map Stellarium. There are also some additional applications in the Graphics section of the menu: Dia Diagram editor, computer-assisted design tools FreeCAD and LibreCAD, and a simple graphics editor Pencil. You can get a flavour of the applications in the Education menu on the screenshot. Apart from the list of applications, there is another difference between the versions Core and Educational of Zorin OS 6. It is not education-oriented, though. The Look Changer utility in the Educational version of Zorin OS includes an ability to choose from a larger set of desktop styles compared to the Core. For example, the Educational version gives you an option to use Mac OS style. Unfortunately, the Zorin Look Changer is only available in the installed operating system, so I cannot give you any screenshots of how it looks. What are the differences compared to Edubuntu? As you can see, many education-oriented applications in Zorin OS 6 Educational are the same as are provided in Edubuntu 12.04. But there are some differences as well, so you may wish to check in the details which distribution better suits your needs. A run of the Live version of either operating system will be sufficient for initial checks. 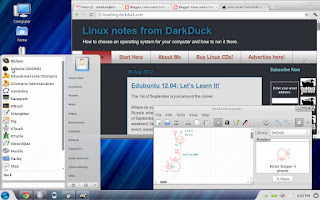 What is radically different between Edubuntu and Zorin OS Educational? Zorin is not targeted at either teachers or laboratory technical staff. While Edubuntu includes many tools for setting up a class, monitoring the students' activities or broadcasting a training session, you will not find these tools in the default Zorin OS Educational. It does not mean you cannot run them: they are all available in the Ubuntu / Edubuntu repositories for a free downloading. However, this does mean you need to install them separately. And last but not least, I would name an interface difference. Edubuntu 12.04 comes with the controversial Unity interface, although the official page says you can separately install Edubuntu packages on top of KDE-based Kubuntu as well. I believe that you can use other flavours of Ubuntu (Xubuntu, Lubuntu) and its derivatives (Mint, for example) as well. In contrast, Zorin OS Educational follows the Zorin custom of providing a Windows 7-styled interface by default, with an option to select a different style via Zorin Look Changer. You may ask who is the target user group for the Zorin OS 6 Educational? From my point of view, it is predominantly home users who want to leave the world of proprietary operating systems in favour of Free Open Source Software, and at the same time who need special tools for education purposes. It would seem to be most suitable for home-schooling families. Zorin OS 6 is not, in my opinion, oriented to organizational users such as teachers or lab computer specialists. Of course, they can use this OS as well, but it will require some amount of initial configuration. Do you use Zorin OS Educational in your family? What is your opinion of this distribution? Is the educational version free? If so I wonder why the MacOS view is available for free under the educational but not the core version. Yes, Edu version is free. I think Mac style is available there to attract more Edu users. The Core version has enough fans itself. I have sent numerous emails to zorinos in regards to their lightweight version of zorin os without any response,,, i'm on my 5th email and still no response, this type of lack luster performance and or neglect has kept me from even trying to os. I figure if they can't answer emails how well are they handling everything else. And before anyone says it takes time to answer, this is over a month. I don't think that e-mail to developers is the best way to get support in FOSS world. Usually you can better support from community. As far as I know, Zorin team provides e-mail support only to customers who donated to their project. Have you donated? There's an alternative: IRC or forum. Check their Contacts page. Is there a list of applications installed with each version? I am interested in the Ultimate or business version but no where can I find anything that helps determine which apps are installed in which versions.